Join us and the Ogden Symphony Ballet Association (OSBA) as we present the Utah Symphony twice this summer! The first performance is Friday, June 29 with a patriotic evening of symphony music under the stars! Conductor John Morris Russell will lead the orchestra in a patriotic celebration featuring Broadway, country music and X-Factor star Rachel Potter performing all your red, white and blue favorites. The second show is Tuesday, August 7 highlighting the iconic songs of Frank Sinatra & Ella Fitzgerald performed by Jenkins, vocalist, and Tony DeSare, vocalist and pianist. 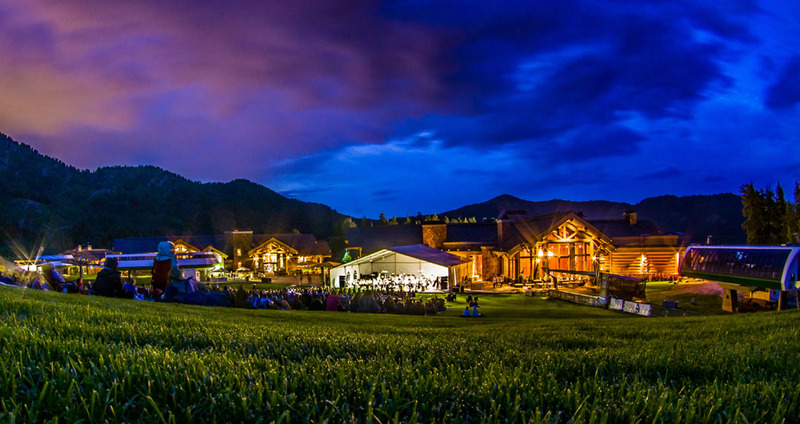 The Utah Symphony will perform in front of the beautiful backdrop of the Ogden Valley and Earl’s Lodge. Earl’s Lodge will have food and drinks available starting at 5:30 pm. A special symphony menu will be available for purchase. The venue will open at 6:30 pm. Arrive early for best seating options. The performance length will be approximately two hours with a 20-minute intermission. A special activity for children will take place before the performance again this year. Riverton Music’s Musical Petting Zoo will be on site encouraging children to touch, play and explore many different musical instruments starting at 6:30 pm. Tickets for the Utah Symphony at Snowbasin Resort are $25 for general admission lawn seating, $5 for children 12 years old and under, and $50 for VIP seating. VIP seating includes premier seating closer to the stage. Please note General Admission does not include a chair. Please bring blankets and low chairs (cannot fit a basketball underneath). Tickets can be purchased online at http://www.snowbasin.com or www.symphonyballet.org, over the phone at 801-399-9214, or in person at the Ogden Symphony Ballet Association ticket office at 638 26th Street in Ogden Monday through Friday from 9 am to 5 pm. Tickets are not available in advance at Snowbasin Resort. For more information call (801)-620-1000 or visit http://www.snowbasin.com or www.symphonyballet.org. About Snowbasin Resort: Snowbasin Resort is an all-season recreation resort located in Huntsville, Utah, less than 35 miles North of Salt Lake City. Top rated by Ski Magazine in the categories of Service, On-Mountain Food, Lifts and Grooming, it has one of the easiest drives from Salt Lake International Airport as well as quick access to the Park City area and downtown Ogden. With 3,000 skiable acres and 3,000 vertical feet, Snowbasin Resort is best known for wide-open bowls, gladed runs, manicured groomers, powder stashes days after a storm and excellent service. Snowbasin Resort offers summer activities on Saturdays and Sundays, including the popular Blues, Brews & BBQ free summer concert series. Enjoy award-winning cuisine including mountaintop dining with spectacular views and magnificent day lodges. Consistently recognized as one of the best family resorts in North America, Snowbasin Resort is one of the oldest continuously operating ski resort in the nation and is a member of the Grand America Hotels and Resorts family. Sister properties include Sun Valley Resort, Grand America Hotel, Little America Hotel (all Salt Lake City, UT), The Westgate Hotel, San Diego, CA, Little America Flagstaff, AZ, Little America, WY, and Little America, Cheyenne, WY. To learn more, visit http://www.snowbasin.com or call 801.620.1000. About Ogden Symphony Ballet Association: Ogden Symphony Ballet Association (OSBA) is a community arts non-profit dedicated to promoting classical music and dance in the Greater Ogden area. We believe the arts have the power to inspire and uplift. And we are firmly committed to providing everyone in our community with greater access to the arts. OSBA has been presenting world-class classical music programs in Ogden for over sixty-five years. Our concerts feature star-studded talent rivaling performances in much larger cities. Each year, over 20,000 people attend our performances. In addition, OSBA actively works to engage and educate younger patrons. We also offer a variety of music education classes, from Masterworks Music Detectives to Music Explorers. We partner with local community organizations to expand these programs to reach even more people through our free lectures, after-school programs, discounts and complimentary ticket programs, and Masterclasses.